Jurien Bay, is a coastal town in the Wheatbelt region of Western Australia, 220km north of Perth facing the Indian Ocean.HistoryThe coastline around Jurien Bay was first known to Europeans in the 17th century. Jurien Bay is known for wildlife, beaches, nature, parks, and trails. Your plan includes some of its best attractions: get interesting insight from Tours, take in the waterfront activity at Jurien Bay Boat Harbour, enjoy the sand and surf at Sandy Cape Recreation Park, and make a trip to Jurien Bay Jetty. To find where to stay, maps, photos, and other tourist information, read Jurien Bay driving holiday planning app . Johannesburg, South Africa to Jurien Bay is an approximately 16-hour flight. The time zone difference when traveling from Johannesburg to Jurien Bay is 6 hours. Cap off your sightseeing on the 11th (Thu) early enough to travel to Geraldton. Geraldton is a coastal city in the Mid West region of Western Australia, located 424km north of Perth.At June 2015 Geraldton had an estimated urban population of 39,825. Geraldton is known for museums, historic sites, beaches, adventure, and wildlife. 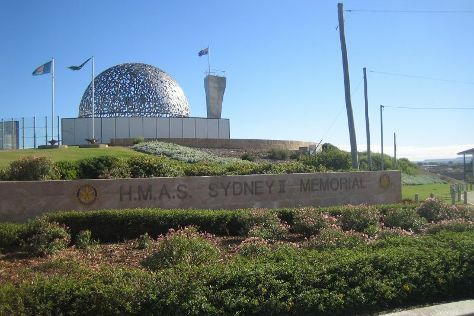 Your plan includes some of its best attractions: brush up on your military savvy at HMAS Sydney II Memorial, take in the waterfront at The Esplanade, enjoy the sand and surf at Town Beach, and get engrossed in the history at Museum of Geraldton. To see where to stay, other places to visit, ratings, and more tourist information, read our Geraldton day trip planner . You can drive from Jurien Bay to Geraldton in 2.5 hours. April in Geraldton sees daily highs of 33°C and lows of 18°C at night. Wrap up your sightseeing on the 17th (Wed) to allow time to drive to Kalbarri. Kalbarri is known for nature, zoos & aquariums, wildlife, adventure, and beaches. Your plan includes some of its best attractions: get to know the resident critters at Rainbow Jungle, get great views at Red Bluff, explore and take pictures at Big River Ranch, and get interesting insight from Tours. Find out how to plan Kalbarri trip without stress by asking Inspirock to help create an itinerary. You can drive from Geraldton to Kalbarri in 2 hours. Another option is to do a combination of bus and taxi. Finish up your sightseeing early on the 24th (Wed) so you can go by car to Coral Bay. Coral Bay is a small town on the coast of Western Australia, north of Perth. Spend the 26th (Fri) observing fascinating marine mammals with a dolphin and whale watching tour. And it doesn't end there: see some colorful creatures with a scuba or snorkeling tour, identify plant and animal life at Ningaloo Marine Park, get outside with Aqua Rush, and tour the pleasant surroundings at The Coral Bay Shark Nursery. To find photos, ratings, other places to visit, and other tourist information, read our Coral Bay day trip planner. Traveling by car from Kalbarri to Coral Bay takes 7 hours. Alternatively, you can do a combination of bus and flight; or take a bus. Wrap up your sightseeing on the 27th (Sat) to allow time to travel to Karratha. Karratha is a city in the Pilbara region of Western Australia, adjoining the port of Dampier. On the 28th (Sun), go for a walk through Cossack Heritage Trail, grab your bike and head to Yaburara Heritage Trail, and then get great views at Staircase To The Moon. Get ready for a full day of sightseeing on the 29th (Mon): explore the striking landscape of Millstream-Chichester National Park. To find maps, other places to visit, reviews, and more tourist information, go to the Karratha online trip builder . You can drive from Coral Bay to Karratha in 5.5 hours. Another option is to fly. Wrap up your sightseeing by early afternoon on the 30th (Tue) to allow time for travel back home.